Structural Quiz - What is wrong with this picture? This first photo shows the garage wall above the water heater. You're probably confused because the entire double top plate is missing - has been completely eaten away by dry rot and termites. 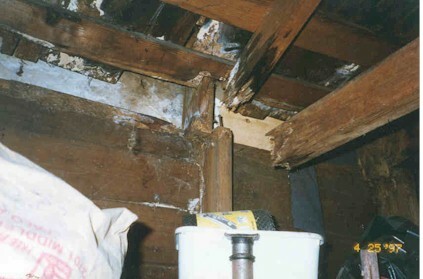 The missing top plate is the connection point between the roof rafters, ceiling joist (seen here flapping in the wind), and the wall. In this house, some exterior wall stucco is holding everything together, but the roof is actively collapsing. From subsequent study of self-collapsing buildings, this is actually a very typical mechanism for buildings to collapse - in all cases I've seen, its been the top plate disintegrating first. Here is another view above the doorway that was earlier concealed by furniture. 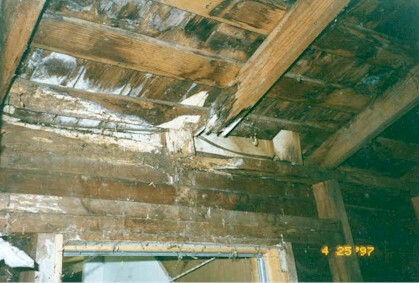 A vestigal section of the top plate can be seen in the lower right side, but is soon lost, and the rafter tail is fully rotted. The ceiling joist for this rafter had falled down to the floor.